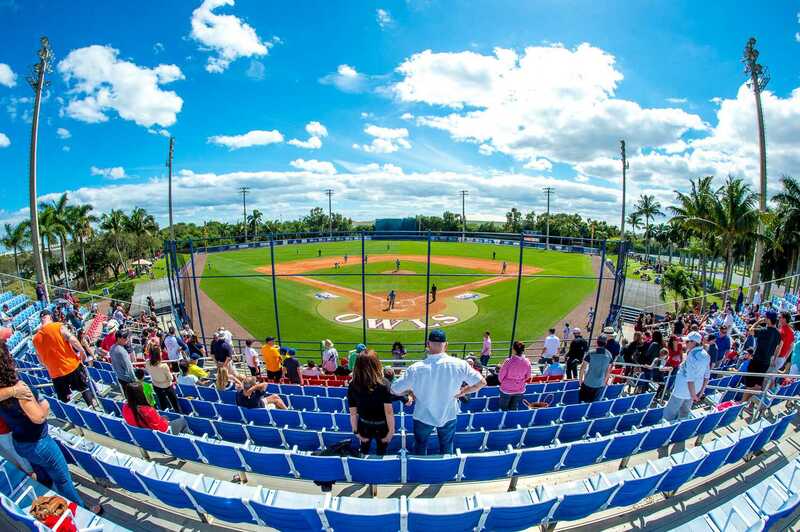 FAU Baseball got out to an early 12-0 lead and held on for a 12-7 victory over Jacksonville, following a rain delay that lasted over five hours. The game from start to finish lasted nine hours and 20 minutes. No.3 FAU (41-18-1) avenges their 5-3 loss to Jacksonville in their first game of the regional. They advance to face no.1 overall seed Florida tomorrow, whom they must beat twice to advance to the Super Regionals. 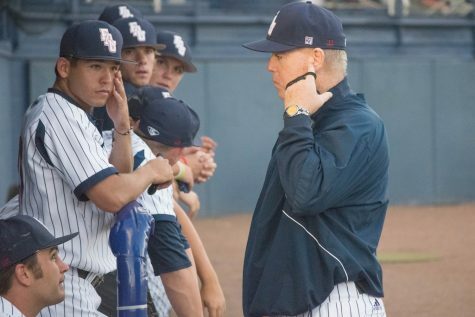 No.2 Jacksonville (41-21) is officially eliminated after also losing last night to Florida, 3-2. Similar to yesterday the Owls offense got off to a hot start. With leadoff hitter shortstop Tyler Frank on first center fielder Cody Wilson launched the ball to dead center field just out of reach of the Dolphins outfielder. The ball then ricocheted off the top of the wall and Wilson was able to round the bases for an inside the park home run. That was just the first homerun of the inning. Catcher Gunnar Lambert later sent a 3-run shot to right field, this time over the fence, to give FAU a 5-0 lead. The Owls matched that run total in the next inning, this time scoring five runs on six hits. This inning featured the Owls third home run in two innings. Left fielder Eric Rivera sent a two-run shot to left center. That was followed later on by third baseman Joe Montes’ RBI single up the middle for the Owls 10th hit of the game. After being robbed of a grand slam in the prior inning the Owls were able to add more runs onto their lead in the fourth. With the bases loaded second baseman Richie Nizza’s grounder went through the left side, scoring two runs, and putting FAU ahead 12-0 after four innings. While the Owls were scoring run after run FAU starting pitcher, Jake Miednik, was making sure the opposite was happening for Jacksonville. He allowed just one hit in the first five innings, and at one point retired nine straight Dolphins batters. Things started to slowly unravel for Miednik though in the sixth inning. He walked the first three Dolphins batters to load the bases before allowing a two run RBI single, ending his night. Relief pitcher Chris Moore came on and immediately allowed an RBI single, and later an RBI sac fly, making it 12-4 through six innings. Jacksonville continued to make up for lost time in the seventh with an RBI single. Moore was pulled from the game after hitting a batter, which loaded the bases with no outs. Jordan Poore came on and allowed back to back runs to score by a Sac fly, and RBI double. He quickly struck out a batter but then lightning in the area sent the game into a delay with runners on second and third for Jacksonville with two outs. After the five hour and 25-minute delay Drew Peden came on and battled back from a 2-0 count to keep the runners stranded with a strikeout. He went the rest of the way allowing no runs and just three hits along with striking out three to secure the win. 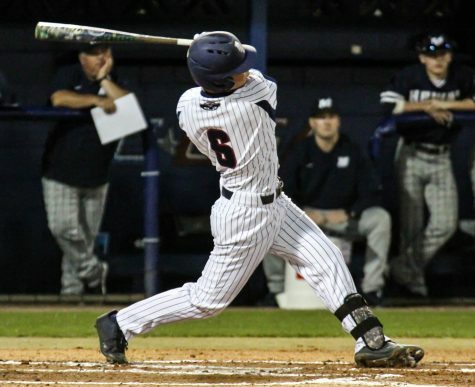 All nine FAU starters recorded a hit with seven recording two or more. The team as a whole recorded 17 hits, one shy of tying the season high. Wilson led the way going 3-for-4 with two runs scored and three RBIs. Lambert was 2-for-4 with two runs scored and three RBIs. 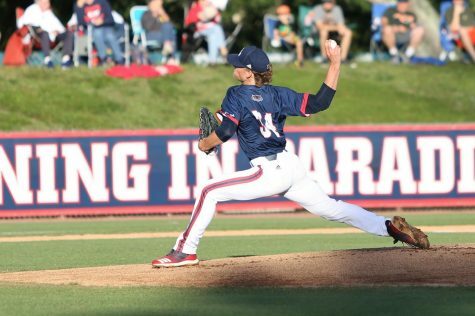 In possibly his last start as an Owl senior Jake Miednik earned his win eighth win of the season allowing just two hits and striking out four in six innings. First pitch for tomorrow’s game is scheduled for 1:00 p.m. If the Owls were to win they would face UF again later that night in a winner take all matchup.